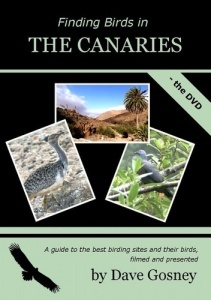 This DVD takes you island-hopping to five of the islands in the Canaries archipelago, showing you the best sites for birds such as the laurel pigeons, Houbara Bustards, Fuerteventura Chat and Blue Chaffinch and takes you out to sea to look for White-faced, Bulwer’s and Band-rumped Petrels. There’s no better way to plan your trip than to watch this DVD showing almost all the key species. The best sites - see what it's like to go birding in 17 sites and get an idea of what birds you might see and how close you could get to them. The best birds - sit back and enjoy footage of over 50 species, including both laurel pigeons, Houbara Bustard, 4 species of petrel and most of the endemic species and races, all filmed using high-definition digital video cameras. The best information - find out more about the sites and their birds, including tips on how to identify the petrels and laurel pigeons and what makes so many of the forms here different from anywhere else in the world.